The pairing of the composers Jānis Ivanovs and Juris Karlsons on this latest release from the Latvian based record label Skani is apposite. As a symphonist, Ivanovs is the most distinguished and prolific to have hailed from that country in the second half of the 20th century. Karlsons was a pupil in the older man’s composition class, and furthermore completed and orchestrated his Symphony No. 21, which was left incomplete at his death. Ivanovs’ Symphony No. 5 was composed at the end of the war, and premiered in Moscow on May 10, 1946. Within a week, a further performance took place, this time in Riga. It initially met with positive acclaim, but later suffered criticism for being formalistic, thus not conforming to the Soviet ideal of social realism. The composer, who described the work as failing “ to portray the bright, life-affirming feelings of the Soviet person”, later vowed to counter this opprobrium in its successor, the Symphony No. 6. When asked what the theme of his Fifth Symphony was, Ivanovs remained steadfastly tight-lipped. The Symphony was composed against the backdrop of the turmoil that beset Latvia at the time. The country’s hard-won independence, gained in 1918, was interrupted at the start of World War II when it was forcibly incorporated into the Soviet Union. In 1941 the Nazis invaded and occupied it prior to a Soviet reoccupation in 1944. The work is in four movements. The outer movements seem to echo the tragedy of war. Combative, powerfully etched and epic are adjectives I would ascribe to the opening movement. The finale likewise speaks with dramatic force. The slow movement is elegiac and brooding. Ivanovs lets more light into the Allegro third movement. Latvian folk music invests the music with a dance-like character, but the melancholic slow waltz which ends the movement has a haunting quality. The Latvian SSR Composer’s Union in 1985 focussed their attentions on the 40th anniversary of victory in the Second World War. 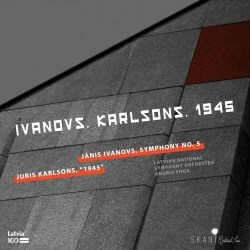 A celebratory concert was given on 14 April that year in which Ivanov's Fifth was paired with Karlson’s Music for Symphony Orchestra ‘1945’. The memories and recollections of war, of the people of Leningrad that the composer met, formed the inspiration for this eleven minute score. Portent, dread, anguish and pain, reinforced by persistent ostinatos, sit shoulder to shoulder with more lyrical sections. At one point a waltz, featuring an accordion, recalls Soviet-era war films. Rhythmic tensions and dazzling orchestration add power and potency to this stirring music. What we have are two commanding scores, each of which certainly packs a punch. Both are colourfully orchestrated, and the recording reveals a wealth of instrumental detail. I can’t fault in any way the Latvian National Symphony orchestra’s confident playing under Andris Poga’s inspirational direction.